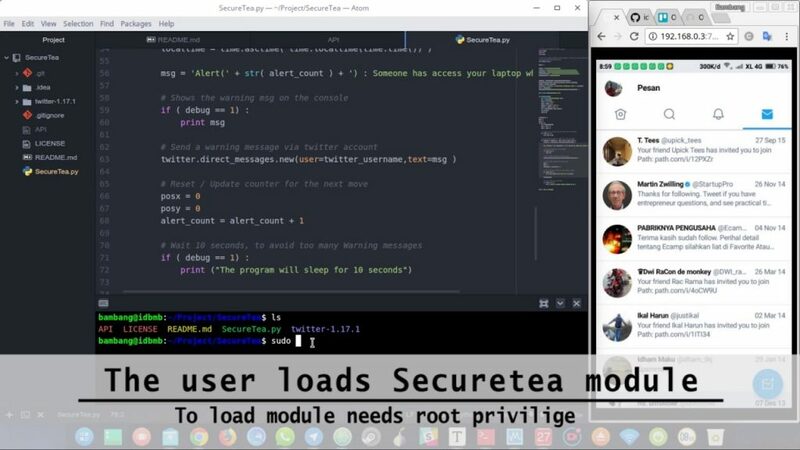 The OWASP SecureTea Project is a application designed to help Secure a person’s laptop or computer with IoT (Internet Of Things) for notify users via twitter, whenever anyone accessing his laptop or computer. The OWASP SecureTea Project that was developed to be used by anyone who is interested in Security IOT (Internet of Things) and still needs further development. To alert the user via twitter, whenever her laptop had been accessed someone. Visit https://apps.twitter.com and “Create new app” to obtain authentication and token codes. Optionally in “SecureTea.py” You can set debug = 1 to enable the console log (default: enabled). or set debug = 0without logging in console. Install Mouse / Wireless Mouse Touchpad if not functioning properly (Linux / Raspberry machine). laptop access by moving the mouse / touchpad to see the cumulative X and Y coordinates on the console. If you have a twitter app installed on your phone, you can get updates on the “message” from your twitter account.